Ingredients: Caprylyl Methicone, Aqua (Water), PEG-12 Dimethicone/PPG-20 Crosspolymer, Glycerin, Propanediol, Sodium Polyacrylate, Leontopodium Alpinum Callus Culture Extract, Disodium Acetyl Glucosamine Phosphate, Proline, Alanine, Serine, Xylitol, Xylitylglucoside, Anhydroxylitol, Adansonia Digitata Fruit Extract, Polypodium Vulgare Rhizome Extract, Cetraria Islandica Thallus Extract, Sphagnum Magellanicum Extract, Pseudoalteromonas Ferment Extract, Tocopherol, Tocopheryl Acetate, Mangifera Indica Seed Butter, Orbignya Oleifera Seed Oil, Squalane, Lecithin, Hexamethyldisiloxane, Trimethylsiloxysilicate, Cyclopentasiloxane, Dimethicone, Polysilicone-11, Dimethicone/Vinyl Dimethicone Crosspolymer, Hydroxyethyl Acrylate/Sodium Acryloyldimethyl Taurate Copolymer, Xanthan Gum, Citric Acid, Sodium Phosphate, Sodium Hydroxide, Sodium Benzoate, Potassium Sorbate, Caprylyl Glycol, Ethylhexylglycerin, Phenoxyethanol, Chlorphenesin. 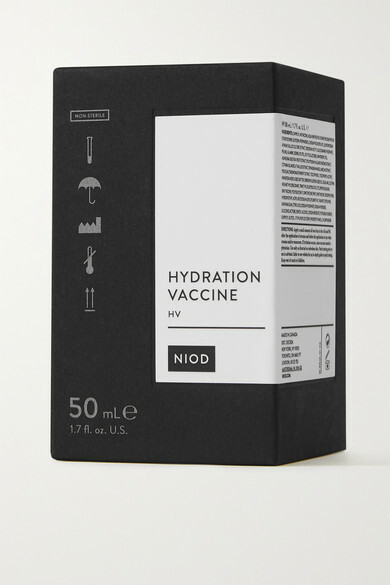 NIOD's 'Hydration Vaccine' is an innovative formulation that supplements your skin's loss of natural moisturizing factors. Instead of concealing dehydration by sitting on the skin, this way of rebuilding natural water content can help your complexion look up to 20 years younger. Its Adaptive Flexo-Silicone Mesh Complex not only locks in moisture, but acts as a smooth base layer for makeup thanks to its diffusion and setting properties. The brand recommends using it in conjunction with the Multi-Molecular Hyaluronic Complex.